Radiological technology is the production of medical images commonly called X-rays, of internal organs and structures. They are produced by passing a small, highly controlled amount of radiation through the human body, and capturing the resulting image on an image recording device. When X-rays penetrate the body, they are absorbed in varying amounts by different parts of the anatomy. Bones, for example, will absorb much of the radiation and, therefore, appear white or light gray on the image, whereas soft tissue absorbs little radiation and appears dark. Contrast media are sometimes used to enhance certain organs and structures that otherwise are not visualized on medical X-ray images. The field of radiological technology also includes therapeutic procedures, often referred to as interventional radiology. Interventional Radiology is used in the detection, diagnosis and treatment of injury and disease. General Radiology is used to detect bone fractures and pathological processes, locate foreign objects in the body, and demonstrate the relationship between bone and soft tissue. Fluoroscopy produces real-time X-ray images. Fluoroscopy is used in conjunction with contrast media to enable visualization of internal structures such as the gastrointestinal tract, blood vessels and various organs during diagnostic and therapeutic procedures. Fluoroscopy is also performed in the operating room during surgery providing the surgeon visual guidance for various surgical procedures. Play an integral role in the detection of injury and disease; they are the medical personnel who perform diagnostic imaging examinations, including mammography and computerized tomography. They are responsible for accurately positioning patients and ensuring that a quality diagnostic image is produced. Work closely with patients, doctors and other health professionals as part of the interdisciplinary health care team. Use cutting-edge medical imaging technology and advanced computer systems to perform complex anatomical scans, many in real-time, to produce and enhance radiographic images. Why become a Radiological Technologist? Radiological Technologists are vital members of the interprofessional health care team devoted to patient care. Technologists must have the technical expertise to operate sophisticated instruments, but must also have the humanistic skills necessary to communicate with patients, problem-solve, and work well with other members of the health care team. A comprehensive study of human osteology with the emphasis on practical application to radiographs of the normal axial and appendicular skeleton. This course is designed to introduce the learner to the complexities of diagnostic and therapeutic imaging in the healthcare setting. 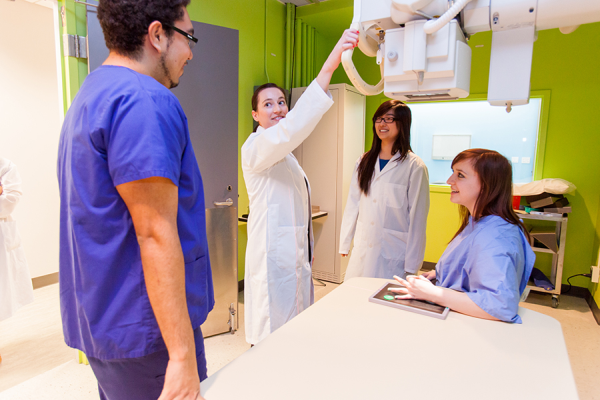 Learners will develop an understanding of what it means to be a medical radiation technologist, a healthcare professional, how to collaborate interprofessionally. As well, learners will be exposed through a series of seminars delivered by healthcare professionals from the practice setting, to a variety of imaging modalities used in the diagnosis and treatment of patients. Modalities such as X-ray, Computed Tomography (CT), Magnetic Resonance Imaging (MRI), Ultrasound (US), Positron Emission Tomography (PET), and Image Guidance for Radiation Therapy will be explored. Additional topics relating to the imaging modalities will be covered including informatics. The purpose of this course is to introduce learners to the principles of medical image recording and equipment. In this course, learners will gain introductory knowledge on how radiological images are produced, manipulated, and critiqued in terms of diagnostic quality. Learners will examine how information flows from the patient to the observer in four distinct stages. This course is a continuation of the concepts and practice learned in Diagnostic Instrumentation I. Building upon previous knowledge, the learner will continue to gain insight into the principles of medical image recording, and will further explore the modalities of CR and DR, in greater depth. The link between Digital Imaging and Picture Archiving and Communication System (PACS) will be emphasized, and the relationship between Hospital Information System (HIS), Radiology Information System (RIS) and PACS will be explored. Radiographic Methodology I focus on aiding learners to achieve the skills necessary to safely and correctly complete radiographic studies of the appendicular skeleton, chest and abdomen. The fundamental principles of radiographic image production, the ability to analyze radiographic images for correct positioning and technical factor selection, and the parameters that define optimal diagnostic quality of a radiographic image will be introduced in this course. Examples of selective courses that are available to MRS students are: Physics of MRI, MRI Anatomy and Pathology, Informatics, Mammography, Patient Education, Supportive and Palliative Care, and many more.